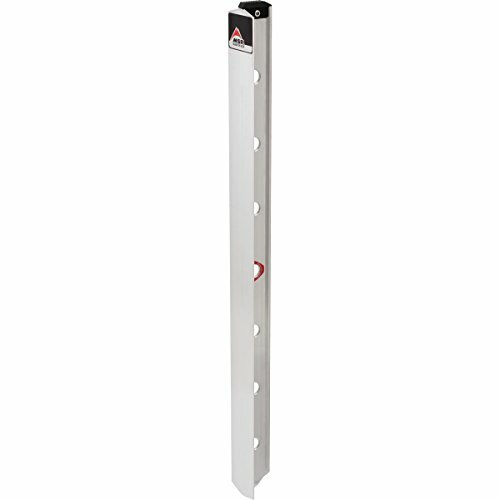 The MSR Snow Picket is the most widely used and trusted piece of snow protection made. Our updated design boots durability and ease-of-placement, providing fast and reliable snow protection when it counts. Designed for ski mountaineering, glacial travel, and high-end alpinism, the Ultralight Ice Screw says it all in the name. Weighing in at 45% lighter than Black Diamond's Express Screws, the Ultralight Screw combines a steel tip with an aluminum body and forged aluminum hanger that features two clip-in points. The innovative wire-gate Express handle shaves more weight and also clicks open and closed. The Ultralights are also easily identified by length with the classic BD color scheme. Materials: Hanger: Forged Aluminum Body: Aluminum; Tip: Stainless Steel. Aluminum body with steel tip. Aluminum forged hanger with two clip-in points. Wire-gate Express handle. Color-coded Express knobs. Weight: 13 cm 74g (2.6 oz. ); 16 cm 81g (2.9 oz. ); 19 cm 89g (3.1 oz. ); 22 cm 96g (3.4 oz.). Strength: 10 kN (2,248 lbf). Spot clean. . 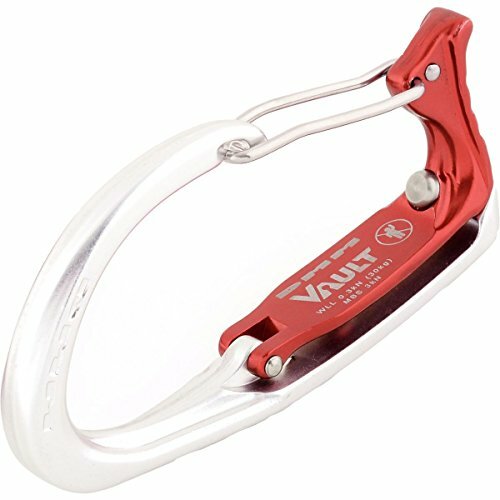 Unlike most pull-apart plastic hangers, DMM's metal Vault secures your ice tools throughout the climb. The wire gate keeps the Vault as light as its plastic predecessors, and the locking gate secures your valuable ice screws and axes on approaches and descents. 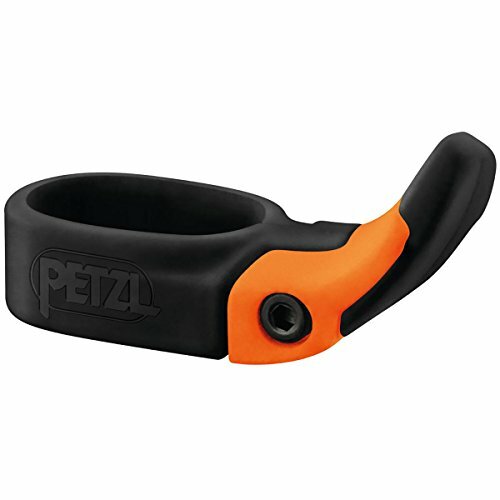 Use the Petzl Trigrest Hand Rest when you need to cross over or choke up before a big move. 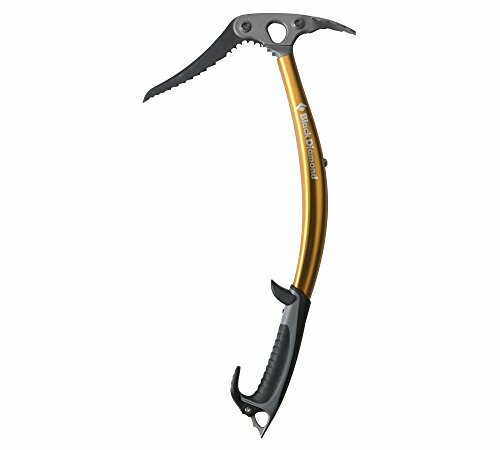 The Trigrest improves your grip on your handle-less ice axe, so you won't have to worry about dropping it. Since it has a tool-less adjustment system, it's easy to slide this hand rest up and out of the way when you need the shaft to go in deep on alpine climbs. In the low position, this hand rest provides a brace for your index to boost grip strength and planting precision. The Trigrest works with the Petzl Ride, Glacier, Glacier Literide, Summit, Sum'tec. and Gully, and it weighs 15 grams. 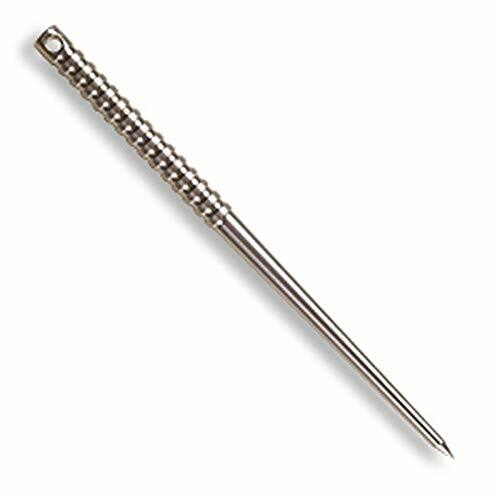 Titanium Ice Pick by Shomer-Tec is a useful tool made of solid 6AL4V titanium.It is tough, lightweight, and will never rust. This rod has a textured handle and tapers down to a very sharp point. This tool may just save your life, so make sure to bring one with you on your cold outdoor expeditions. DRY ICE Tools are patented Indoor Ice Axes used by looping stiff rubber straps over the holds used in rock climbing gyms. The climbing motion is exactly the same as in ice and mixed climbing. 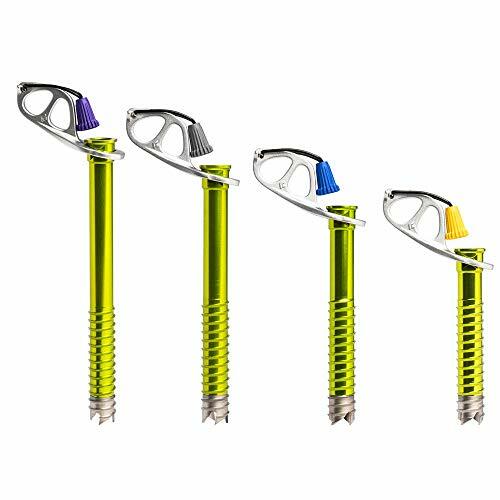 Now you can prepare for the upcoming ice season in your gym without worrying about injuring someone or puncturing the pads with sharp points raining down from above. DRY ICE Tools are sold in pairs. Weight per Pair: 1lb 4oz (574g) Also available from Furnace Industries: ICICLES youth-sized ice climbing training tools, KRONOS Ice Climbing Tools, Tethering Devices, Replacement Straps. Hand Made Indoor Ice Axes made for Climbers, by Climbers. Train Indoors for Ice and Mixed Climbing. 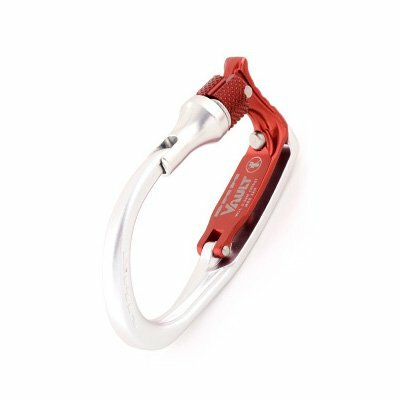 Gym Safe Ice Climbing Tools. Hand Crafted Wooden Handle, Precision Engineered Reinforced Rubber Strap. Superior Ergonomics prevent the 'pinky crush' endemic to other Indoor Ice Tools. Most gyms will require a tether or simple keeper cord to prevent dropping of tools. A must have for all person on the ice. 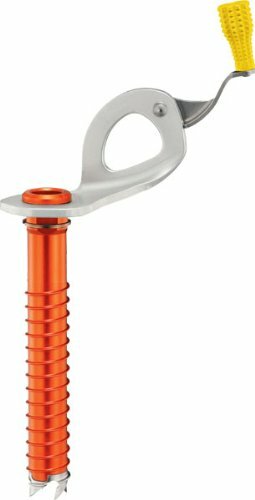 Petzl's Ice Pick is a versatile ice climbing pick designed for use with Petzl's Quark, Nomic, and Ergo ice axes. Durable steel construction and a stable, tapered shape ensure solid purchase in ice with easier removal. 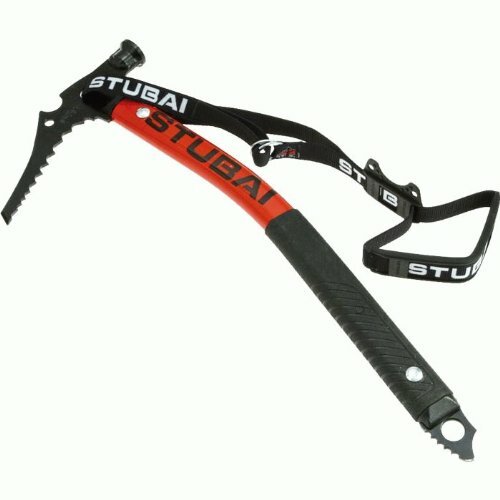 Great value tool for use in extreme mountain and ice environments. The Hornets attributes: simple, reliable and light weight a great tool for beginners to develop their skills. 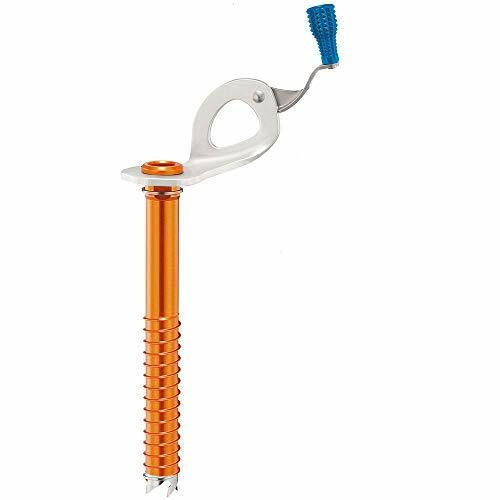 A great vertical ice tool at an amazing price. The Hornet features a bent aluminum shaft, aggressive pick, sticky rubber grip, and a one piece steel head. Tools come with leash! MAXIMIZED WEIGHT REDUCTION: Ultralight aluminum tube, ideal for mountaineering when reduced equipment weight is a priority. EASIER BITE: The shape of the drill is optimized to facilitate bite into the ice. QUICK: Integrated flexible crank provides excellent grip and an optimized lever, making it easier and faster to screw in. 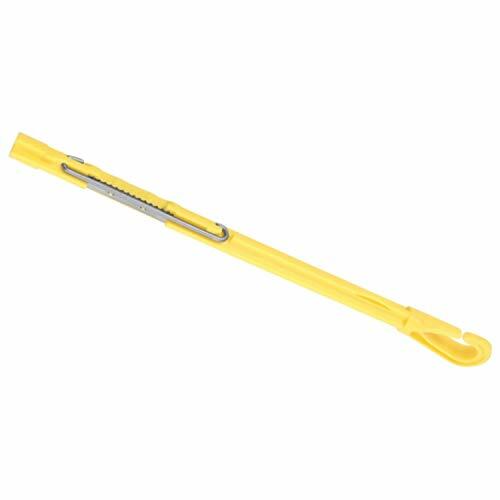 DURABLE MATERIAL: Materials include a steel drill, anodized aluminum tube, and aluminum hanger. FULLY EQUIPPED: Color-coding facilitates identifying the length of a screw. 1.Versatile and easy to use - these ice grips slip easily over most types of footwear. 2.Material: TPE, no bad smell. which maintains its elasticity down to -40 degrees C.
3.10 medium carbon steel studs (Extra 10 Studs) provide enhanced traction on icy surfaces. 4.Replaceable studs to prolong product life (replaceable studs available here). 5.Suitable for men, women and kids, ice cleats fit all kinds of shoes. 7.Easy on and off, only take 5 seconds. 8.Walk outside confidently on wet grass, mud and snow, Cheap and durable, convenient to do everything in snowy days with ice cleats. 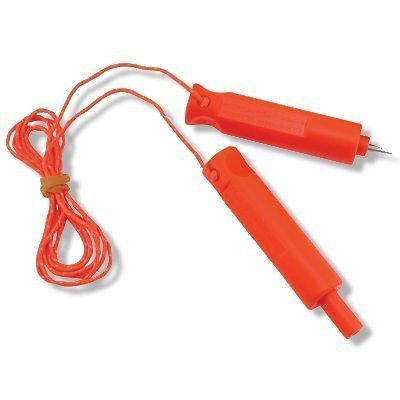 9.Snow & Ice shoe spike is also great for: ice fishing, walking, sledding, hiking, stream fly fishing and hunting. Use anywhere traction is needed. 1.place edge marked FRONT over toe of shoe ,ensuring spikes face the floor . 2.Stretch Ice Grip over sole of shoe and attach edge marked BACK over the shoe heel , ensuring a good tight fit is achieved. 3.Make sure the front labet is facing out. 4.Hook the front of your Magic Spike over the toe. 5.Stretch to the back of your shoe. 6.Check the rubber that is securely over the sides of your shoe. Do not use these grips in NON-icy conditions to avoid excessive wear to the metal studs. Do not wear indoors ,Always take care walking in icy conditions even when wearing Ice grips . Perfect For Winter-Ice Cleats are perfect for outdoor worker,anyone who want extra stability safety and traction. 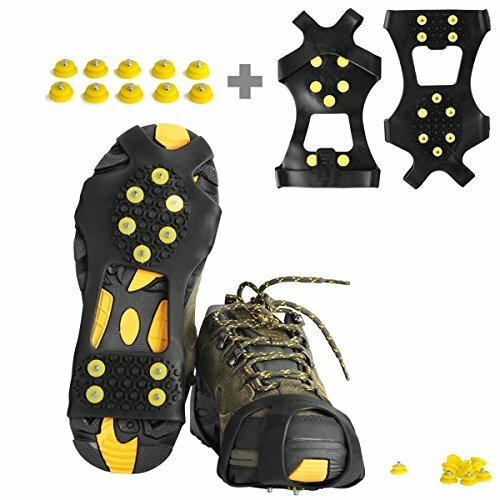 This traction cleat fit boots,casual and dress shoes Great for ice fishing, hunting, walking,running, snow shoveling, etc. Good Quality-- The material of the ice grips Made of TPE and non-slip studs. 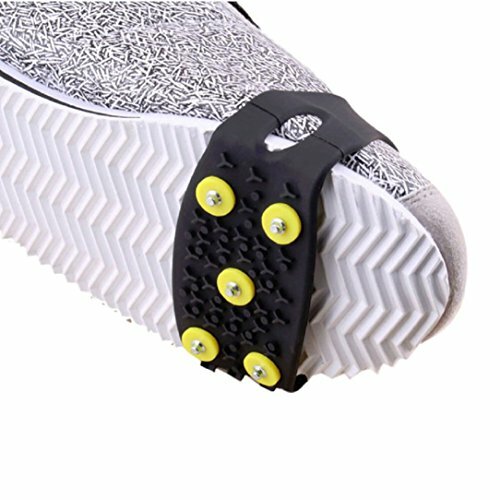 The traction spikes use the special Ground-gripping steel studs offer excellent traction on ice and snow, Easy to get on and off with light weight. Easy To Use-- Easy to get on and off. This traction cleat is easy on/off, Full foot slip protection with heel and forefoot cleats maintains traction throughout your natural stride while walking, lightweight fold up to fit in your pocket. Strong-- Ice Cleats Strong Performs Under-40 C, The traction spikes use the special Ground-gripping steel studs offer excellent traction on ice and snow. 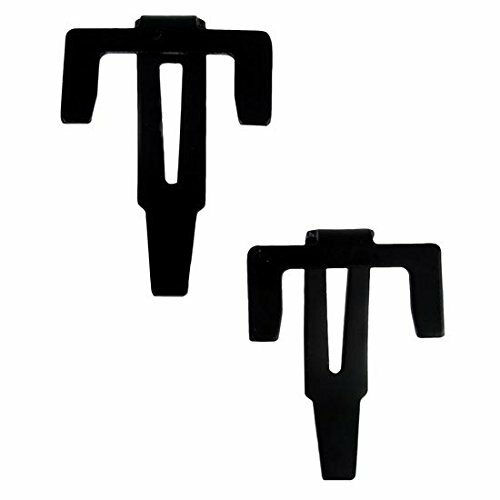 Snow Grips suitable for all kinds of sport shoes, climbing boots, double boots etc.